The newest issue is here! Caribbean Seas Shawl, by Ava Lynne Green knit in DK weight yarn. 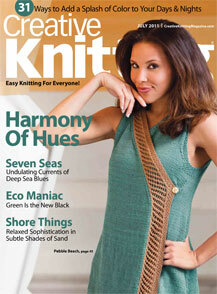 Sample in the magazine was knit with Woodland, from Classic Elite Yarns which is a 65% wool, 35% nettles blend yarn. Oyster Bay Afghan, by Shirley Macnulty knit in Worsted Weight yarn. Sample in the magazine was knit with Therapi from South West Trading Co., which is a 50% fine wool, 30% Bowlder (Jadeite), 20% silk blend yarn. Ollie the Octopus, by Anie Marriott knit in DK weight yarn. Sample in the magazine was knit with King Cole Dolly Mix DK from Cascade Yarns. Super cute toy for kids! I am a new follower. Was doing a search for the Raspberry stitch and found your tute on YouTube. I have subscribed to Knitting Paradise and someone there was talking about the Raspberry stitch.THEN I found your other videos on YT. Thank you for all of the help, your videos are great. I am trying ot get back into knitting after not knitting for several years.